Betula alleghaniensis (B. lutea) is a medium-sized, typically single stemmed, deciduous tree reaching 60–80 feet (18–24 m) tall (exceptionally to 100 ft (30 m)with a trunk typically 2–3 ft (0.61–0.91 m) in diameter. Yellow birch is a relatively long lived birch which typically grows 150 years and may even grow up to 300 in old growth forests. It reproduces primarily by seed. Mature trees typically start producing seeds at about 40 years but may start as young as 20. The optimum age for seed production is about 70 years. Good seed crops are not produced every year, and tend to be produced in intervals of 1–4 years with the years between good years having little seed production. The seeds germinate best on mossy logs, decaying wood or cracks in boulders since they cannot penetrate the leaf litter layer. 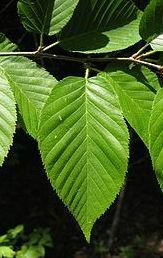 Yellow birch saplings will not establish in full shade (under a closed canopy) so they typically need disturbances in a forest in order to establish and grow. The bark on mature trees is a shiny yellow-bronze which flakes and peels in fine horizontal strips. The bark often has small black marks and dark horizontal lenticels. After the tree reaches a diameter greater than 1 ft the bark typically stops shredding and reveal a platy outer bark although the thinner branches will still have the shreddy bark. It is differentiated from the similar black birch by its yellow, peeling barrk. The twigs, when scraped, have a slight scent of wintergreen oil, though not as strongly so as the related sweet birch which is the only other birch in North America to also smell of wintergreen. However, the potency of the odor is not considered a reliable identification method unless it is combined with other characteristics. The leaves are alternately placed on the stem, oval in shape with a pointed tip and often a slightly heart shaped (cordate) base. They are 2–5 in (5.1–12.7 cm) long and typically half as wide with a finely serrated (doubly serrate) margin. They are dark green in color on the upper side and lighter on the bottom, the veins on the bottom are also usually pubescent. The leaves arise in pairs or singularly from small spur shoots. In the fall the leaves turn a bright yellow color. The flowers are wind-pollinated catkins which open in later spring. Both male and female flowers will occur on the same tree making the plant monoecious. Several species of Lepidoptera including the mourning cloak (Nymphalis antiopa) and dreamy duskywing (Erynnis icelus) feed on B. alleghaniensis as caterpillars. Yellow birch is often associated with eastern hemlock throughout its range due to their similar preferences in habitat. It grows from 0–500 m in elevation but may grow up to 1000 m. It reaches its maximum importance in the transition zone between low elevation deciduous forests and high elevation spruce and fir forests. The seed is a winged fruit (samara) with two wings which are shorter than the width of the seed which matures and gets released in autumn.